I’m sure you guys have heard about this book…it’s been everywhere! in my continual efforts to simplify my life (and because I was intrigued by all the hype that it had been getting), I bought it. I had a little bit of skepticism when I started reading it because a) things with a lot of hype don’t often live up to it; b) I’d tried other cleaning methods before & wasn’t sure what this could say that I hadn’t already heard; and c) I’m not the biggest fan of self-help/tutorial books. but I have to say, I was pleasantly surprised to find that I enjoyed reading this for the most part. as you may have read/heard, the central tenet of the book is that when it comes to things, there’s really only one rule: discard anything that doesn’t spark joy. it sounds a little out there & laughable at first, but it really helped me when I tackled my closet after finishing the book. I didn’t think about how much I had spent on an item (and how much I hadn’t worn it) or of the situations when I might “need” something like this, or any of the other hundred justifications why you’re holding on to something. it was simple: as the book advises, I picked up each piece of clothing in my hands and asked myself then & there “does this make me happy to have this in my life?”. if the answer was yes, it stayed. if the answer was no or I don’t know, it went to the donate pile. within an hour, I had 2 bags of clothing & other items that were earmarked for savers & goodwill. another thing that stuck with me about the book was the idea of instead of focusing on what to get rid of, we should focus instead on what we’d like to keep. that shift in paradigm was eye-opening to me & made things a lot easier. I found that I was very clear about the things that I loved having in my life and coming from that selection perspective was much easier than asking myself what I didn’t want in my life. it’s crazy how sometimes looking at a situation from a different angle or point of view makes everything more clear. while I do think that there’s a lot of good in this book, there are aspects of it that may be a little “out there” for some people. Marie Kondo advocates for speaking to your things – greeting them, thanking them for the work they do, etc. – which I find a little unconventional but also logical in a way. I’m open to anything that inspires me to be more grateful & appreciative for the things I do have, and I am grateful for everything my clothes do for me, so it’s not so crazy to actually go out of your way to say those things aloud. 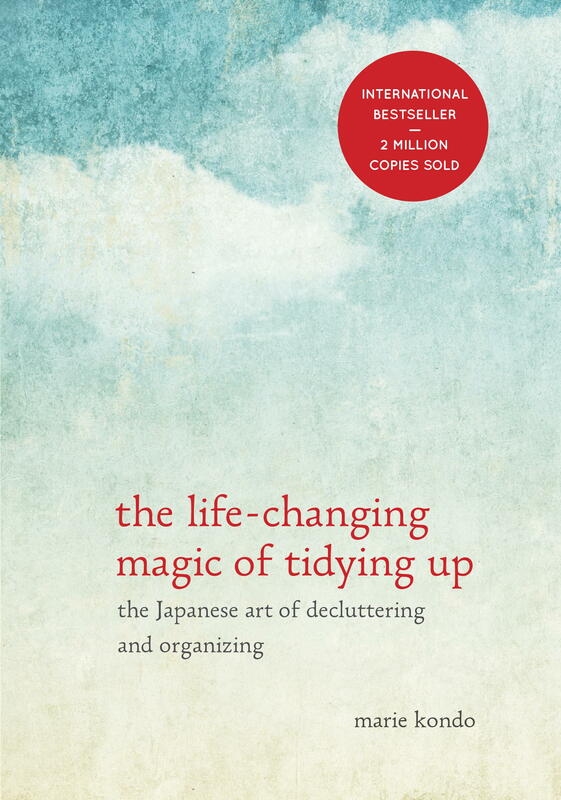 she also talks about the bigger picture beyond tidying and makes connections between the state of your things & the state of your relationships/life, which was actually enlightening for me but might be unexpected for someone who picked this up as a straight-forward decluttering guide. if you’re not opposed to a little bit of whimsy & philosophy in the midst of a lot of more traditional advice on how to streamline your belongings & your life, this book will be a good read. I’m curious: have any of you guys read it? what did you think? did it work for you?